My interest in this article was created by readers who contacted me to vent their frustration with EchoH2Water “Echo” after I started writing about hydrogen. The article has been a long time in the making, but I took it off the back burner this afternoon when an Echo dealer pointed me towards a couple of videos on YouTube. I thought I had heard everything when it came to bashing in the alkaline water ionizer industry, but I was wrong. I’m accustomed to hearing alkaline water reps bashing their competitors. The only thing that the finger pointing achieved was to confuse the public who couldn’t differentiate the good guys from the bad guys (or maybe, there weren’t any good guys but I digress). When it comes to Echo, the bashing wasn’t limited to the typical “Enagic hates Echo” or “Alkaviva hates Echo” rants that I would ignore. The rants I was hearing and reading about were coming from the Echo’s own customers, dealers, and even their own employees. I never expected that. How can one company anger so many people so fast? I talked to a lot of people before writing this article in an effort to obtain a balanced perspective. Normally, it is pretty easy to find people who support both sides of virtually any argument. I don’t remember ever reporting on a subject where so many of the opinions were so similar and so negative. In order to keep this article from becoming ridiculously long and losing your attention, I have limited the number of quotes I recorded, but I’m pretty sure you will get the message. For those who are impatient like me and want to get right to the bottom line, you might want to skip to the videos and the “broken promises” below. 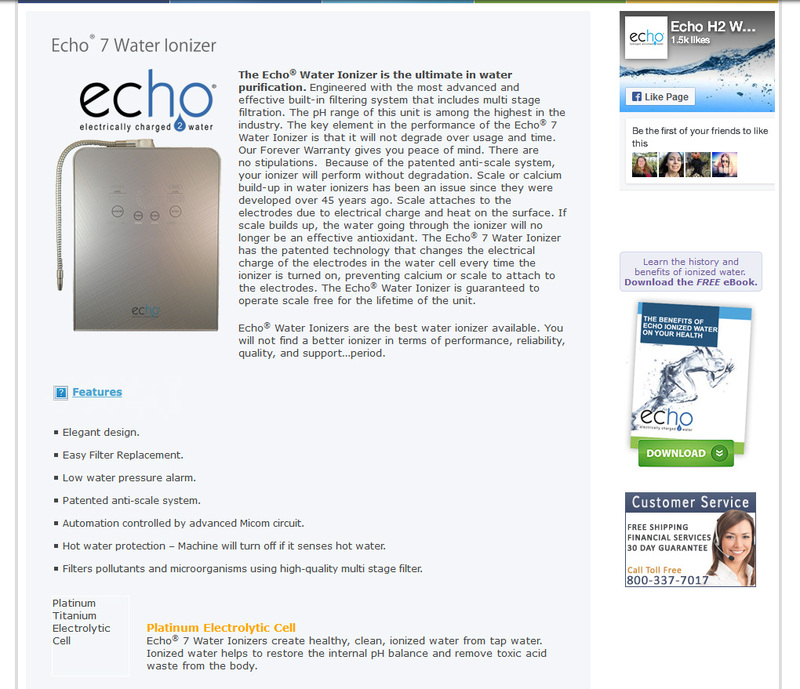 As one might expect from the alkaline water ionizer industry, the competitors attacked Echo. Alkaviva dealers were justifiably upset. The owner of Echo left Alkaviva with their technology and then claimed that the new product was better than the original, which was not true. Kangen dealers always get targeted because Enagic is the big fish in the water ionizer industry. Enagic dealers were also justifiably upset because Echo was claiming superiority when it came to producing hydrogen when it was not true. In fact, the exact opposite is true if Enagic owners use their reusable citric acid filters once per week to clean their machines. When citric acid is used weekly to clean a water ionizer, the acid will remove recently built-up limescale before it has the chance to inhibit the ability of the machine to produce hydrogen. Today, the dealers who left Enagic to join Echo are angry…really angry. Echo is bad-mouthing the Hydrogen Infusion Machine (HIM) technology which is only going to make Echo look foolish. HIM’s produce better and more consistent results than Echo machines will ever achieve, regardless of the source water. Understanding this fact is as simple as examining the water cells of the two technologies. If I had to guess, my bet would be that Echo is bashing the HIM technology because they can’t get it for themselves. I would hate to be in Echo’s shoes when it inevitably has to knock at the HIM manufacturer’s door if it wants to survive in the hydrogen industry. “I left Enagic to join Echo because I was uncomfortable. Now I don’t want anything to do with the industry”. It reminds me of the old expression: “fool me once, shame on you….fool me twice, shame on me”. The outcome is unfortunate because the people that left Enagic are people that obviously took the time to learn the science which is an indication that they actually cared about helping others. When good people leave an industry, the entire industry loses. “We bought the Echo 9 machine on the belief that we would get at least 1.0 ppm and maybe as much as 3.0 ppm of H2. That never came close to happening and about a month later, my machine only produced 0.2 ppm of H2. My friend in another city also bought one and her machine wasn’t producing any H2 at all. When I complained to the company, I was told that my source water was the problem and the Echo warranty doesn’t cover source water issues. What the h*ll is that all about? The only reason I bought the machine was for the hydrogen”. One employee told me: “I was treated like dirt. I couldn’t wait to get out of there”. Today, I took this article off the back burner (it takes me a long time to put together an article like this) when I got a call from an Echo dealer who told me that somebody named Jo Miller (I don’t know who this person is as I never spoke to anyone by that name) posted the videos that you can see below on YouTube. Please watch the videos if you are considering buying an Echo or if you are contemplating being an Echo dealer. The second video deals with leaking and over-heating issues. You can actually see the machine smoking in the first few seconds of the video and the employee says: “smoking again” at the 0:18 mark. The employee then says: “it’s arcing now” at the 0:43 mark before the water cell begins to leak badly. The highlight low point of video takes place at the 1:03 mark when the employee says: “he wants me to take the used power supplies, from this batch, from these machines, and put them into those machines and send them out”. WHAT????? He is talking about being ordered to take parts from faulty machines that are smoking and causing metal parts to glow and spark from over heating (see the video at the 1:50 mark for sparking and at 2:13 for the hot red glow), and install them in other machines to send out to customers. Unless the guys in the video are Academy Award worthy actors, they appear to simply going about their business. I don’t know about you, but I find the content of the second video extremely offensive. Do the videos above give you confidence in the “performance, reliability, and quality of Echo products? The video showing Echo employees using power tools to remove calcium build-up from Echo machines tells a different story. If you listen carefully to the audio in the videos, you will hear Echo employees mocking the Echo claim that their products don’t scale up. None of the Echo customers that I spoke with were able to achieve results anything close the claims made on the website. Most customers were unable to get more than 0.5 ppm of H2 (sometimes a lot less). If customers set the power at Levels 2 or 3 instead of Level 4 (which is what Echo recommends because people report adverse affects at Level 4), the H2 output is even lower. The Echo website claims to have 30 patents on its product. Really? That seems like a lot. I did some digging tosee what I could find. From what I can tell, some of the patents are pending and some have expired. Unless I’m mistaken, I learned that Echo doesn’t actually own any patents on the machine. So, what does Echo mean when they claim they hold 30 patents? It certainly sounds like marketing spin instead of telling the truth. Here is a screen cap of the Echo website from March 7, 2014. Here is what you won’t see on the 2014 version of the Echo website: any mention of hydrogen whatsoever. The owner of Echo is telling anyone that will listen that Echo is the leading player in the hydrogen industry. He is also telling people that he will be coming out with a new machine in a couple of months that will be far superior to what they have now. Unfortunately, the guy has been saying the same thing for two years. If he thinks he is going to get the technology from the HIM manufacturer that already has a distributor selling their product in the USA, I expect he is barking up the wrong tree. He should try to remember the phase: “you can fool some of the people some of the time, but you can’t fool all of the people all of the time”. I suspect Echo is running out of time. I don’t know about you, but I’m finding it impossible to believe anything that Echo claims. I don’t know the people at Echo. They have never done anything bad to me. They could be good people for all I know. However, when a company is “first-in” to a new market I believe the company has a moral responsibility to hold themselves to the highest ethical standards. The public is vulnerable in start-up situations because there isn’t anybody around to dispute false claims or make a company accountable for its actions. It seems obvious to me that Echo has failed miserably in their moral duty to serve the public honestly and with integrity. In fact, Echo appears to be doing the exact opposite which means they may potentially damage the entire H2 industry in America. I feel bad for the Echo dealers who recommended Echo products to their customers. I also feel bad for the medical professionals who recommended Echo products to their patients and peers and ended up with egg on their face. Trust is hard to come by and even harder to regain once it has been lost. Lessons for new companies entering the hydrogen industry in America. Update: A better solution for purchasing H2 products? Yes. It is now a couple of years after I wrote the above article. There is a company called Brilliantz (see www.brilliantz.com) which has been selling H2 products for about the same amount of time as Echo. I like the people at Brilliantz because they treat their customers with respect and their products work. Brilliantz has been selling their H2 products (they sell other products as well) at pretty much the same price level as other H2 companies through an affiliate network. The company recently made the decision to sell directly to the public. As a result, Brilliantz has dropped their prices by 50% which makes the decision a no-brainer for those who do their homework and find themselves on the Brilliantz website. My mother has an Echo 9 after her Echo 7 had such bad overheating issues it became hot to the touch and made no H2. The Echo 9 consistently produces 0.3-0.4ppm of H2, well below the advertised 3.0ppm. It’s plagued with calcium buildup which causes the water to dribble out unless we clean it regularly, something that we were never told by Echo sales agents or corporate employees. We inquired about this issue and were told to run acidic water through the machine for 10-15 minutes daily.. Basically we were told to waste water daily or the machine wouldn’t produce H2. My mother was very disappointed in Echo after spending over $2000 on the Echo 7 and when that didn’t work, being charged an upgrade fee for the Echo 9, which she should have received for free. I talked to a number of Echo dealers and customers, but I wanted to get to more customers before writing my story. When the videos showed up on YouTube, I decided it was more important to get the story out. I was hoping that people would provide comments, positive or negative. I feel bad for your Mom. The results that you reported on her machine seem to be right in line with everything that I found when doing my investigation. Echo’s suggestion of running acidic water through the machine for 10 to 15 minutes per day is outrageous. That means running 5 or more gallons of water down the drain per day. Nobody in their right mind would do that as it is wasteful and environmentally irresponsible. You could use a de-scaling pre-filter to remove calcium from the water, but then your Mom’s unit probably wouldn’t produce any H2 at all. Wow, now it is all making sense. I had a bad experience with Echo Water as well. I ordered an Echo 9 on pre-order in August last year. I was told it would be there in 2 weeks. So I called back 2 weeks later to ask if the machines were in, and when I finally got someone to answer the phone and talk to me, they were not in and they had no idea when they would be in either. How could they work there and not know something like that? There were clearly some communication problems going on. Long story short, I received my machine at the end of OCTOBER, that I paid for in AUGUST! When I received it, it took another 2 weeks for the installer to come and install it. And then once I finally had it up and running, the water flow was so slow and the water tasted horrible! I had white flakes in my water too. I called in to complain and they told me it was calcium and good for me and just to drink it anyway. And if I wanted I could put lemon juice in it to make it taste better. I spent over $2000 on a water machine that isn’t automatically drinkable? The negatives continued last month when I noticed my filter was almost needing to be changed. Which was weird considering I was told it would last a year. I have a pre filter so I figured I could reset it whenever it alerted me because my profilter would prolong the life of the machine filter, that is the whole reason I bought the pre filter. Well once my machine alerted me to change my filter, I was no longer able to use the machine. It would run for 10 seconds and shut off. I called the office and they informed me that I would have to buy a new filter to be able to continue using my machine. Even though in reality, it still should have had a lot of use left! I definitely feel ripped off by Echo Water, in every way shape and form. Did you try to get your money back? Maybe I’m just a grumpy old guy, but I would have demanded my money back. Unfortunately for me, the 30 day money back return policy starts the days it arrives at your house. It took 2 weeks to get it installed, which I guess Echo has a nation wide install network, but when I asked about my install they said they were looking for an installer in my area. But I thought they had a nationwide network? So anyway, by the time I got it installed I only had 2 weeks left to test it out. You would not believe how difficult it is to get hold of someone at their office. Then when I did talk to them, everyone I talked to said everything was working like normal, and if I would continue to drink it, the bad taste would go away and I would start to feel effects. So I tried it, but no such luck. I still drink it, but have yet to see any benefits, even after all this time. Did the water taste bad all the time, or only when at high pH levels? High pH water often takes develops a “taste” but normally, the taste of the water produced by alkaline water machines is pretty good as they incorporate carbon filters. It’s unfortunate a company like Echo® is allowed to exist. They give the industry a black eye. H2 Molecular hydrogen is so promising, and to have somebody with such a bad reputation and horrible customer service is a shame. I personally had to replace so many of the Echo® 7 & 9 machines and parts it was truly ridiculous. I made trip after trip to fix or change tubes from excessive calcium blockage in the lines. There were so many parts missing from the box and things that didn’t work right. The Echo® 9 water machine’s Filter has to be replaced at 1000 gallons and will not even allow you to pour filtered water as the machine shuts down! It is such a scam that I believe the machine shutting down when it needs replaced should be illegal after you spent that much money on it! We had nothing but problems from the beginning!!!! Thanks for adding your comments. It is people like you who make the article come to life because you actually live the story. I wish that I had been able to find you before I wrote the article so that I could have incorporated your comments, but better late than never. I’m just blown away by this story as I have never come across dealers that bash their own company before. For example, the Kangen dealers who left because they were sick and tired of Enagic’s psuedo-science never complained about the products or the service. I knew the situation at Echo was pretty bad, but it is obviously worse than I thought. I would like to hear from an Echo dealer or customer that is happy with Echo because this is feeling really lopsided at this point. You can contact me directly by email or leave a comment here. I was a salesman with Echo for a short while. In that very short span of time, the things I was told, the things I experienced, and the way the company seemed to be run was enough to make me want to pull my hair out for ever getting on board of this sinking ship. I say sinking because the stories they tell, at least at the highest level of mismanagement are so full of sh holes that it would sink if it could float. As previously alluded to, people had paid good money up front for machines that took months to be delivered. The network of installers is virtually non existent. Some waited for week after getting their machines and even after the installation there were issues and the “installer” had to come back. The information sent to the dealers did not coincide with what the customers got as far as what the machines would come with for attachments. Many months before those were made good on. There were times when the company deep in the mud with internal problems would actually have the staff making Desks that wee bought so that the owner did not have to pay to have them bought pre assembled. The Ebook was another source of false information about the filtration that they claimed to have. This was a place for the owner to say how great he was. Yes a legend in his own mind. For sure. It became clear to me that the top level of management was not being honest with his customers and even staff. I never saw a company were the folks who did all the work were being blamed for the problem caused by the Boss. He would never admit wrong doing and he must have had the worlds largest book of excuses ever written for he was never without a soft spoken one. The machines have been taken apart only to find components that were years old outdated and not the current advanced components claimed. I free Fluoride filter that did little at best. I Forever warranty that is of little value seeing the company will probably be gone after people find out just what they are all about. Not to mention the directions being given when something goes wrong with the machine. Overheating was a problem. The tech guys new this bit the owner adamantly denied that there was ever a case of overheating. Ouch. Hot to the touch. I could go on but why there is so much that the Reader would think I was making it up. This company in my opinion is rum by a micro managing egomaniac. He has little regard for other people or the truth. The reason they call themselves Echo is because you keep hearing their name, and not in a good way either. It is companies like this that give an industry a bad name. I ordered an Echo 9 last year after reading great things on the Echo website about the product and the service they offer. One key selling point for me was the provided installation they claim to offer. I’ve had two ionizers previously and neither company offered installation, now after experiencing Echo’s installation process first hand, I can see exactly why no other company offers installation. Echo claims to have a nation wide installer network, as though they are like Comcast or Dish Network. They cause one to believe that installation through Echo is painless and timely, it is neither. After receiving my unit, I patiently awaited for my installer to contact me and schedule a time to come by, the call never came. A week went by without hearing anything from an installer or Echo, so I decided to call them and see the status of my install. After calling 3 times and not getting through I finally was able to talk to the the installation coordinator, I asked him when my installer would be coming and his response was simply “we don’t have an installer in your area yet” and naturally I asked when they would have one and he couldn’t give me a straight answer. After a few more questions he reluctantly admitted that the way they find new installers is via Craigslist ads..seriously? Their “professional” installer network is literally pieced together via Craigslist whenever someone orders a machine. I was not willing to wait until they found Uncle Joe’s Handyman Service online so I decided to call a licensed and insured plumber on my own and pay them to install it(which was schedule and completed two days later). After calling echo and inquiring about being reimbursed for having to pay for my own installation I was told that Echo doesn’t do that. I demanded to speak with the owner, who told me that I should have “waited for our installer to contact you, I’m not paying for people to go hire whoever they want for installs”. I was blown away by the stupidity. He wanted me to wait for the Echo installer, that didn’t exist, to contact me? The title of this article is right on point with “Broken Promises” but not just in regards to the product, the broken promises extend into the service and the character of the CEO as well. I wasn’t aware of the installation “promise” and issues before you and another poster (Noble Jones) brought it up. You gotta luv the “craigslist handyman national installer network”….just kidding. Do you like the machine and if so, have you measured the H2 output? I am a very satisfied customer of Echo H2 Water and became a sales agent for Echo machines for over 18 months – all happy customers. I have introduced many sales agents to Echo and all their customers and referred agents are also very satisfied. Echo is an excellent company and stands behind their excellent products. The very few times any issue came with any machine…Echo was very responsive and took care of the situation quickly. This site is clearly promoting another machine. Thanks for the comment. I was hoping that someone would comment on the positive side of things as nothing in life is all good or all bad. I have the distinct feeling that you are actually the owner of Echo. My suspicion comes from the fact that you said you have been an agent for Echo for 18 months and that you have signed up a lot of agents. Echo is a new start up company and anybody that has been around for 18 months and has signed up a lot of customers and agents would be a celebrity with the company. I did some checking with a few of the Echo agents and employees who have contacted me, and nobody has heard of you. That means you are likely using a fake name, which is ok. What I don’t understand is that if you are so proud of Echo, why wouldn’t you use your own name. Surely you would want the customers and agents that you signed up to see that you are proud of the company and want to stick up for the company and its representatives. The fact that you chose to include a link (URL) in your comment which goes directly to the Echo website rather than to a personal website makes me wonder about your goal. For example, the link included in my comments go directly to my blog and Brett’s link (a person that commented on the article who included a link) goes directly to his website. You indicated that you have a lot of customers and signed up a lot of agents who in turn signed up a lot of customers and they are all happy. It sounds to me like the customers, agents and employees who contributed to my story and those that posted afterwards are talking about a completely different company than the company you are referring to. There is one way to know for sure if you are telling the truth with your comments William. I would be happy to talk to you and to your customers and agents to verify your comments. Please feel free to email me with your telephone number and a convenient time to call so that we can get the verification process started. I will have no problem writing “your side of the story” which would cover all of the good things about Echo if your information checks out. I have learned that at least two people (one an agent of Echo and another an employee of Echo) that commented to my story used anonymous names. They wanted anonymity because they feared being attacked by the owner of Echo and they didn’t want others to be hurt as a result. It turns out that they were smart to do so as I have been informed that one of the people that did comment with their real name had his wife severely criticized by the owner of Echo afterwards for lying and plotting against Echo which is absolutely not true. As far as William’s claims that my site is promoting another company, that is not true. My blog is about educating others about what I learn while doing my research. I speak well of the companies that I believe in, just like I point out the faults in companies that I think are misleading the public. There is no conspiracy here. I have been receiving messages that the owner of Echo has been telling everyone in his network that my story is all lies and is part of a negative campaign against Echo. I don’t own shares in H2FX. I don’t get paid by H2FX. I did sign up as an Affiliate of H2FX, but I rebated my commissions back to the people who bought because they found me on the WaterFYI website and I have never used the WaterFYI website for profit. After being accused by the owner of Echo of being in cahoots with H2FX, I resigned as an Affiliate so that there would be absolutely no incentive for me to promote H2FX. Despite my resignation with H2FX, I still love the company, their products, and especially the people working at the company because they are outstanding human beings who tell the truth and actually care about helping others. I promise everyone reading this comment that everything I wrote in the article was presented in the form it was sent to me by others. I did not lie or exaggerate about anything in the article. I actually took it pretty easy on Echo because a number of communications that I received were not printable due the language used and the angry sentiment expressed in the content of some comments. I have learned in the past couple of weeks that the owner of Echo has been telling people that my article about Echo was inspired by Tywon Hubbard, the owner of H2FX. That is absolutely not true. In fact, Tywon refused to comment for the article that I wrote, or to post a follow up comment. Tywon is a God-fearing man who is ethical to a fault and has a very strong moral code. I have had the good fortune to get to know Tywon in the last few months as he asked me to be part of the testing process for his new HIM machine. During that time, Tywon has never made a single negative or derogatory comment about anyone or anything. I don’t know how Tywon manages to keep taking the high road, but he does, and I have all the more respect for the man because of it (but I would still like to know what he knows as I’m sure it would make for great reading material). I find it very interesting that the owner of Echo has gone on the attack against H2FX when H2FX had absolutely zero to do with the article and the company was not even mentioned in the story about Echo. As of yesterday (when I contacted Tywon), the owner of Echo has never contacted H2FX to ask questions despite the fact that Tywon worked for Echo in the past. Tywon told me that he was very loyal to Echo and parted ways with Echo on very good terms. Tywon indicated that he would be happy to talk to the owner of Echo or anyone else about his new HIM machine. Tywon Hubbard is a extremely honest and open person and if you take the time to call him, you will see for yourself. I’m not a psychologist, but it sure looks to me like the owner of Echo is trying to deflect the blame for his problems on to H2FX instead of “manning up” and apologizing for his personal and company failures. I have made a lot of mistakes in my life and I find the best strategy is to admit the mistake as soon as I become aware of it, apologize to anyone that my mistake may have harmed in any way, and then strive to do better. I hope the owner of Echo can will do the same. Please don’t use my name as I’m trying to get an ionizer repaired/replaced for a customer and that would jeopardize my “’negotiations’ with the owner”. All of the complaints in the story and the comments are TRUE. People need to know he is a fraud. The ONE positive comment looks like the owner wrote it. I can’t even begin to tell you how awful Echo was to work for. Their logistics were a nightmare and I lost sales because they were so slow in delivering. They would promise installations in days or a week that would actually take months. They changed their website so that the place to give credit to the sales agent was dropped. Soon after the site was defunct and not usable but the owner claimed it was getting fixed. Finally the guy creating the site quit or was fired? I began regretting the sales that I made once I began learning that all the promises were lies. The company made commitments to me that never materialized. I’m grateful to you for posting all this because I couldn’t get any validation from Echo employees about what was going on. My experiences with Echo are exactly what people have posted on here. Really, we ought to get a class action on him and put him out of business and try to get money back for people. I feel that perhaps some of us need to contact our own legal professionals to see what can be done. It has come to my attention that past employees and a past sales agent have orchestrated a negative attack campaign against Echo®. I have spent much time pondering and discussing with top sales agents and our marketing officer to know how to handle this situation. These individuals did what they did purposefully with an intent to damage Echo®. They purposely used abused an Echo 7 machine for their purposes. Even though we have definite legal grounds, the decision was made to not retaliate. We don’t want to bring unnecessary attention to what they are doing and don’t enjoy negative energy. If you or any potential customers have been exposed to these fraudulent videos…Please contact me directly. I am only writing this email because I don’t want you to be blind-sided. I want you to be aware. I am happy to discuss and answer any questions or concerns openly. No matter the deception they perpetrate…the Echo® products are the best in the industry. In situations like this we all need to stand up for Echo® and talk about the truth of the Echo products that benefit people all across the world every day. Please share with me any positive experiences you or your clients have received by drinking Echo® Water. We will be adding an area and a page focused to allow people to share their positive experiences about Echo®. We hear them every day but it is time that the world hears it! As many of you know our marketing has not been internet related. Echo is marketed largely by medical professional and well trained individuals that understand the industry. We have hired a CMO has a team of people that will be adding a large amount of the positive info. on the internet. You all will be receiving replicated websites at no charge to be able to market better and process transactions easily. · Echo® 9-The Echo 9 produces hydrogen without any maintenance on the electrolysis chamber. The H2 concentration ranges from .8ppm-over 2ppm as long as there are minerals in the source water. The typical is 1.5ppm of molecular Hydrogen at 2 liters per minute. · The Echo® Forever warranty covers parts, labor, and shipping both directions. There are no exclusions. All customers that purchase the machine have this warranty in place. (The warranty does not cover damage or abuse made to the machine by the customer. Ie. Physical damage, submerging in water, etc.) There has never been a customer that was not supported by the warranty. · Installers- We have hundreds of installers in the USA where our core business is. We add installers as we continue to grow. · Installers- As we grow in each country we develop a network of installers. (NO WE DON’T USE CRAIGSLIST as they portrayed) Our process involves calling and interviewing remodeling contractors, and using Angie’s List for a reference on quality of work. · We are worldwide and have managers in Canada, Scotland, Ireland, London, and Australia. · Shipping for a machine is always free when a machine is purchased at retail pricing. · We do not have excessive calcium build up issues in the Echo® machines unless the power setting is set too high for the water. The Echo® machines power levels are set low from the factory. If there is really high calcium in the source water, it may be good to lower the calcium in the water to lessen normal calcium buildup over years of service. · We have less than a half a percent (.5%) issue or defective rate on Echo® machines. · We have never had any overheating issues with any Echo® 9 machines ever. There was an isolated issue with one small batch of Echo® 7 machines 1 year ago. These machines were all repaired and returned to the customer with no further issues. I appreciate the fact that you care enough to take the time to write in about your experiences so that others can learn from you. I agree with you that the one positive comment looks like it was written by the owner of Echo. It is interesting that another Echo representative sent me an email with almost the identical comment. I think that your use of the word “fraud” when describing the owner of Echo may be overly harsh, but I’m not in your shoes. I have spoken with one Echo agent that said that although there were many problems with Echo machines and installations, that the company did in fact try to fix the problems even if it took a long time to come to a resolution. I don’t think someone who is a fraud would bother with attempting to fix problems. I would like to address the letter sent out to Echo sales agents. To begin, I don’t see anybody orchestrating anything. I have to wonder if the owner of Echo suffers from paranoia. Why would any sane person organize a coordinated attack against a company unless that company did some pretty bad stuff to a lot of people. What could a small group like that hope to achieve? Normal people get on with their lives. I would love to hear about the legal grounds that the owner of Echo is talking about. Who would Echo suit and for what? The Echo owner claims I used “fraudulent videos” in my story. In what way are they fraudulent? Did the machines scale up or not? Did the machines overheat and cause what appears to be smoke but could be steam (either way, that should not be happening) or was it some elaborate scheme? What could be so diabolical about a video taken by employees to show their boss a problem while they were off site? The video was not shown to anyone but the boss and didn’t appear until a year later when another employee felt the need to share the contents of the videos to dealers who were not getting answers from the owner and nobody else. I’m told that the employees in the video were very loyal to Echo and they relied upon their pay checks to support their families. The man “accused” of plotting to hurt Echo had left the company well before the second video was taken which blows up the Echo owner’s theory. The people that appear in the second video and the person that distributed both videos don’t have any affiliation with H2FX (the company that the “accused” set up after leaving Echo). We are talking serious paranoia here or else the accusations are just a diversionary tactic. I originally asked the “accused” gentleman if he would contribute to my article and he said “no”. He has not commented on my article since it was published. I said to him recently “surely you must want to defend yourself and comment” but he wouldn’t comment. He is a better man that me, because if I knew what I’m sure he knows about Echo and I was aware of the smear campaign that the owner of Echo was waging against me, I would be spilling my guts. I don’t know how he is able to maintain the high road. * “no matter the deception they perpetrate….the Echo products are the best in the industry”. My question would be “what deception?” and my research indicates that Echo products are nowhere close to be being the best in the industry and they don’t come anywhere near what the owner claims in terms of performance. * “There has never been a customer that was not supported by the warranty.” My research indicates that customers find if extremely difficult to get warranty work done. For example, the video in my article that shows massive scaling in the machine was taken by employees to show the owner that the machine was scaled up. The only reason that the video was taken is because the owner refused to allow the customer to return the machine and the owner sent the employees out to visit the customer to prove to the customer that there was nothing wrong with the machine. Nobody could make this stuff up. The Echo agent that posted the comment that I’m responding to now obviously doesn’t trust Echo’s warranty program as she posted under an anonymous name because she fears that if she used her real name, the owner of Echo would not honor the warranty. * “We have hundreds of installers in the USA” and “NO WE DON’T USE CRAIGSLIST”. I have been told by many Echo employees and agents that Echo doesn’t have any installers. I have also been told by more than one person that Echo searches for installers from Craigslist. Maybe Echo has changed their policy since I wrote my article, but I don’t know how they would suddenly find hundreds of installers in the last month. * “We do not have excessive calcium build up issues in the Echo® machines unless the power setting is set too high for the water.” I have heard from a number of customers and agents that many of their customers have been told that Echo blames their source water and that there is nothing Echo can do to help them. Either the source water is too soft or too hard. So, the claim about “excessive calcium build up issues” may be technically correct, but if that is true, why are there no warnings on the Echo website or literature which leaves the Echo agents holding the proverbial bag. The agents sell to family and friends and customers who trust them. * “We have less than a half a percent (.5%) issue or defective rate on Echo® machines.” Really? I guess a lot of people are lying to me because the owner is claiming that only 1 out of 200 Echo machines ever have an issue. That is an extraordinary claim when the evidence is overwhelming to the contrary. * “We have never had any overheating issues with any Echo® 9 machines ever.”…. and… “There was an isolated issue with one small batch of Echo® 7 machines 1 year ago.” Which statement is true? Also, if the overheating machine issue took place a year ago as the owner claims, how is it possible that the overheating video was taken fairly recently (after the man accused of trying to plot against Echo had left the company). Perhaps the owner was confused, or maybe the problem wasn’t fixed a year ago after all. I didn’t want to write a negative article about an industry that I love. In fact I resisted writing the article until the videos showed up. I didn’t have anything personal against Echo or its owner. However, since the owner has been claiming that my article has fraudulent videos, that I’m part of perpetrating a deception, and I’m involved in a diabolical plot to harm Echo, I can’t help but take it personally. I don’t have the internal strength of a Tywon Hubbard to turn the other cheek when people are spreading malicious lies about me. I initially finished this comment with a challenge to Echo to “bring it on!”. That would be childish on my part as my ego is getting in the way. My efforts to dig up evidence to prove that I’m “right” or to “win” serves no purpose because this is not about me. I’m just the reporter. My goal is to inform people about what I learn about products and technology developments, to applaud the good things and people in the industry for their efforts as well as trying to keep the bad guys from taking advantage of the public. It is imperative that I remain objective and when it came to this story about Echo, I lost my objectivity because I found what I learned to be offensive. I apologize for getting carried away. I hope that this is the last you hear from me on this topic. YES!!! I agree with you former Echo Agent!! In fact that is EXACTLY what I would like to do!!! Get a bunch of us together to actually file a class action suit against Echo. I am so completely fed up with this company and their BROKEN PROMISES! From the beginning it has been nothing but a NIGHTMARE! I have had all the problems that have been talked about here on this thread. From “free installation” issues and waiting WEEKS to have it installed to the machine working properly for longer than a few weeks. The installation process was an absolute nightmare! I had to set everything up and hire people myself and they only offered to Reimburse me a portion of what I had to pay after doing all the work. They promise to take care of everything, promise that the machine doesn’t ever need to be cleaned unlike “other” ionizers which couldn’t be further from the truth! Why all the LIES? I would like to RETURN my unit but I am a little over 4 months into it. By the time I actually got it set up and installed it was past the 30 days. This All feels like a SCAM!! I have sent it to them for repair going 2 weeks without my ionized water to get it back and NOTHING IS FIXED! They are trying to blame it on my high TDS water. Or possibly my water pressure but yet they never mentioned anything like that from the beginning and before I purchased. They constantly kept telling me to “clean the machine” making ME do something they promised wouldn’t even be necessary!! Now I found another company that sells ionizers that seems to have AMAZING service and understands that you should do a water analysis for the customers area to see what you are working with. Duh. Why wasn’t this done with Echo? I am getting absolutely NOWHERE and it’s just being dragged out. I would like to get a group of us together to sue them for the purchase of the ionizer. And maybe for the stress and anguish this has put me through. They should have a 90 day to 6 month return policy on these things. You don’t even get enough time to test it out or see how it will operate in 30 days! Like I said by the time it got installed that time had passed. So ridiculous!! So I am at a loss for what to do next! I definitely want to SUE them!! Who is WITH me? Let’s get this class action suit STARTED. Former Echo Agent would you be willing to chat with me? Can I contact you? My email is michelle.mcclung@hotmail.com And Rob I would love to also talk to you further about this. Do you have an email I can contact you at? I know this is over a year old but I really could use some HELP here. What they are doing is WRONG. And enough is ENOUGH. The fact that it is STILL happening is ridiculous and completely unfair and I have HAD it! !